There is nothing like having natural beauty around you. Unfortunately sometimes there is not enough space in your backyard or in your home to accomodate everything you would like. Why not think about using the vertical space that is available rather than the surface area. 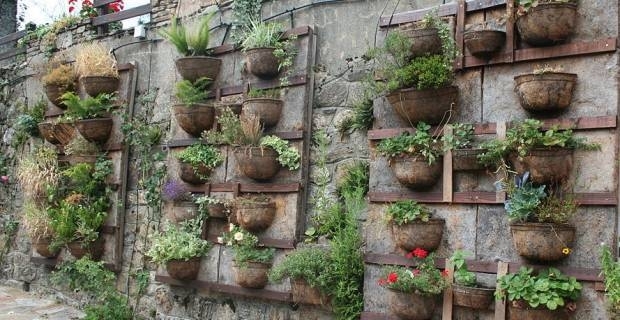 Have a look at some of these vertical garden ideas to get your creativity pumping. 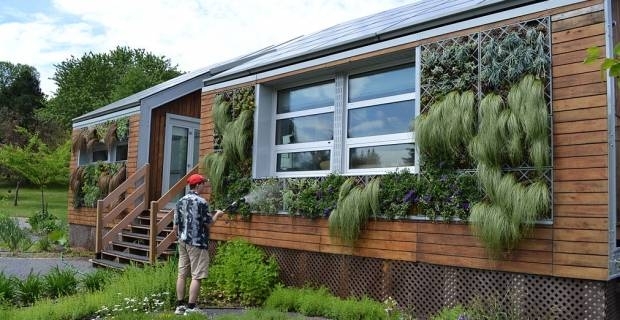 Vertical gardens can be found anywhere from the side of an office building to the side of your garden shed. For the smaller scale gardens, there are many DIY options out there. One of them is the Vertical Pallet Garden that involves getting a pallet, burlap, garden film, soil, furniture stapler, scissors, and plant seeds. Here are the instructions on how to create this unique garden. Besides the aesthetic beauty of outdoor gardens, it is a great natural place for birds and bees to occupy. It also is a absorbs sound and can reduce your bills! This is also a great way to save on air conditioning costs. If you have a rather large vertical garden, the garden will absorb the the heat and the cold acting as both an aircondition and heater through evapotranspiration. Having plants around automatically increases the air quality of the environment by purifying the pollution and releasing clean oxygen. These vertical gardens can also be applied to the interior of your home. If you want a small living wall, you will need to use plants that have a small root system with similar care requirements. A few examples would be succelents or ferns. For those interested in having living artwork in the home check out this tutorial on how to make living succelent art. It's a fun DIY project that can be a great conversation starter. Here are a few other links that give you more vertical garden ideas on creating green walls in your home. When coming up with your own vertical garden ideas, keep in mind where they would get the appropriate amount of light. Just like regular gardens, they will need to be weeded, watered, fertilized, and possibly trimmed. Vertical Gardens are a great way to be unique, increase your standard of healthy living, and add beauty to your home. There are many different sizes and styles of gardens and each one is unique in its own way which adds to the beauty of it. Try and come up with your own vertical garden ideas and see what works best for you. Enjoy!